May | 2013 | Extollagy! It seems obvious, today, when every serious building that predates concrete and brick is made of cut stone, but it’s not. There are plenty of ways of building things without excavating the planet’s hardest, deadest, most presenceful material, cutting it into squares, transporting it to a building site and putting it all together. The proof of this is that some societies have barely done it all: countless non-urban cultures, of course; but also the Chinese, who primarily used cut stone to shore up earthen platforms (Great Wall, anyone), leaving their buildings predominantly timber framed; or the ancient civilisations of Mesopotamia (baked brick) and the Americas, the latter of whom did serious architecture for a millennium or more before turning to stone. And then, to prove my point that this is a Significant Thing to Do, creating an unnerring architecture of cut stone without possessing a single metal tool to cut it with. The reason for my interest, of course, is that there seems to be a particularly strong link between the origins of cut stone buildings and religious architecture. Indeed in most early socieities that developed the technique — from India to Egypt – stone was reserved for temple buildings and burial places and nothing else. So it’s worth emphasising: at its point of origin, this is not an obvious thing to do. It’s an imaginative leap, requiring some level of explanation. Egypt and India are cases in point. Indeed India, under the pharaoh Djoser and the architecture Imhotep in the third millennium BCE, seems to be effectively where it starts chronologically, though the resulting tomb/temple/pyramid complex seems to see all the possibilities of the technique in a single glimpse, even as it petrifies existing motifs from a lost (as standing buildings), but mature, architecture of timber and mud-brick. The entire complex seems to have been designed as a kind of palace for the spirit of the dead pharaoh to inhabit, and this thinking, relating to the fixing of things for eternity, surely drives its creation. Much the same could be said of the Hindu temple, whose fascinating origin in the C5CE comes after a millennium in which Indians experimented in illuminating ways with sculpting existing timber religious spaces into stone, in the form of cave-temples; many early Hindu temples are then sculpted out of living rock, a technique seen everywhere from south-east asia to Ethiopia to the Maya, but nowhere as developed as it was in India. Scholars have speculated that, again, there is some conscious, almost theological process at work here, a thinking about permanency and creation, reflected in a stone architecture that started as life-size sculpture of temporary buildings/highly designed man-made caves before it became standalone temples. Certainly these structures set off various lines of enquiry: about the simple act of moving and shaping stone, vividly illustrated by the great prehistoric stone settings of north-west Europe; about the ways in which ancient Mesopotamians and Greeks made models of themselves as thank-offerings to leave in and around temples, the Greeks doing so as precisely the time — the C8-C5BCE – when they were transforming an architecture of brick and timber to an architecture of stone, and inventing the naked standing statues as a result. About making the impermanent permanent, then, and expressing or channelling some kind of creative power, even as one offers thanks to a greater one; and other lines, in which these spaces are inspired by nature’s own permanent architectonic places, the caves and the mountains that remained sacred in many traditions. So which types of religious building have been around longest? It’s a straight draw, and an illuminating one, too. In the ‘east’ corner, we have the stupa. As all stupas are legendarily derived from the burial mound requested by the Buddha himself, one might say that its invention can be dated to 4485BCE, the year of his death. But the size and significance of this particular monument at the time is unknown (as, indeed is the veracity of the account itself, though I understand the earliest accounts of the Life of the Buddha probably dates to within a century of Shakyamuni’s death); and even more so the extent to which it differed in either respect from other high-status burials — though we do know the Buddha anticipated some kind of pilgrimage dimension, requesting it to be situated at a cross roads so it could be more easily accessed. The Indian landscape contained other such mounds, and perhaps, too some others were so posiitioned and so used. 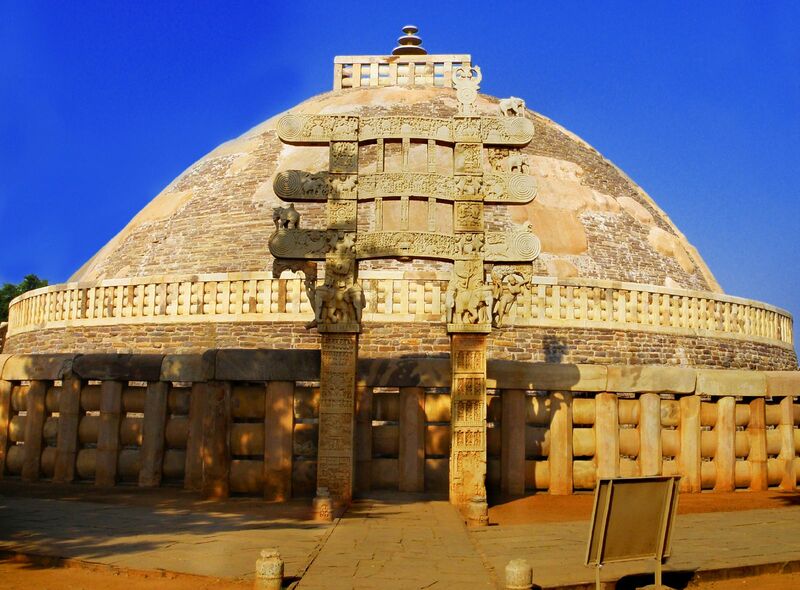 The next milestone in its story is the C3BCE, when, especially under the emperor Ashoka, a step-change occurs: stupas are built in their thousands, they are built of, or have an outer shell of, stone, and they are major focuses of pilgrimage and worship, equipped for rites of circumambulation. Arechaeology, as far as I know, tends to support the idea that is something new: a permanent form of religious building, on a scale that — given India did not at that point have a permanent religious architecture — must have transformed the landscape of the subcontinent. Turning to the ‘west’ corner, we have the synagogue. Its emergence is undated, but many have asked how the Jewish community would have continued to worship during the Babylonian exile of 586BCE, especially as their Temple in Jerusalem had also been destroyed. Would they have tried to continue some form of Temple or worship, given that they already (I believe this is true, rather than a later view read backwards) held that priestly sacrifice was only valid at one place on earth? And if they did not, would they then have found an alternative form of worship that was valid, one in which people met in small groups to pray and study the holy word, facing Jerusalem when they did so? The question is mired in more qualifiers and maybes about this stage of Jewish history than I have the expertise to unravel, but it raises the possibility that the synagogue was born at some point in this period, a few decades long. Even so, like the stupa it raises formal problems. By the time we have any sense of what shape synagogues are, they are axial buildings with the focus of prayer at one end of the long axis: rectangles with a visual focus at one end. Now as an architectural form, pure and simple, this goes back to ancient Mesopotamia, that is it reflects the simplest form of the kind of building that would have been around the exiled Jews in the Babylonian landsape: what is different about the synagogue is not its plan or general form so much as its use, which couldn’t be more different from that of a Mesopotamian temple: no sacred image, no sacrifice, no mighty priesthood, merely a hall for prayer and the study of the Word. Anyway, here, unlike with the stupa, the point of origin is entirely speculative: the synagogue is not *known* to exist, and even then its architectural form is rather unclear, until the end of the third century BCE. By then its context is going to be with the religious buildings of the post-Alexandrine eastern Mediterrean, ie a there will have been a massive dollop of Greek influence in the culture as a whole, though the leap in terms of function is no less profound. In other words, its a draw. Stupa: reasonable case for emergence C5, in serious business C3; synagogue, rather speculative case for origin C6, in serious business C3. The origin of the stupa is later but also more solid; the synagogue older but very speculative, and neither become an established ‘religious building type’ until the c3, when current knowledge might even make the stupa the older of the two, if by a margin that is rather meaningless given the uncertainties. Both have been used continuously ever since. The stupa had spread throughout the ancient world from central asia to Japan by the C6CE, and shape-shifted in a multitude of ways, from the Chinese pagoda to the south-east asian mandala-temples — I call them — from Pagan to Borobodur. The latter are, to me, the high-point of the ‘Indian origin’ tradition of aesthetic ideas about sacred space. 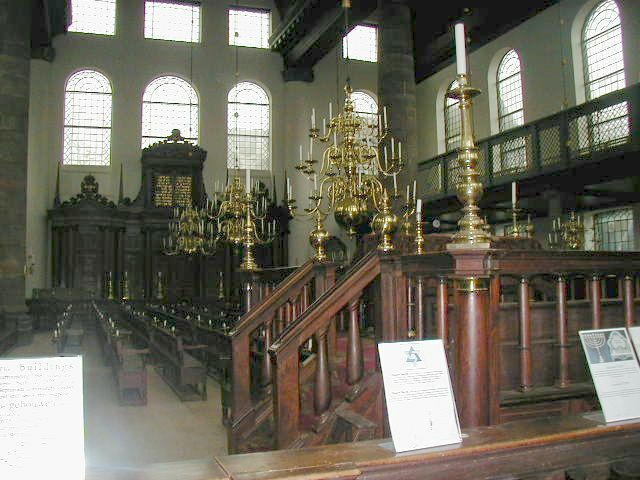 The synagogue spread with the Jewish diaspora, and thus was commonplace in the Middle East and Europe alike, its reach increasingly wide during the first millenium CE and then became global with the globalisation of western culture from the C18. More to the point, without synagogues, no churches or mosques; in particular the fusion of Temple ideas about ritual with synagogue ideas about congregation (in the case of the church), and the Islamic pursuance on a scale never permitted to Jews of an art of the Word and an architecture of congregational prayer, fuelled several of the great creative achievements of the ‘Middle Eastern/Western’ tradition of religious architecture — not least the gothic church and the Timurid/Safavid and Ottoman visions of the mosque, arguably the greatest achievements of those cultures. Here the inheritance is as much conceptual as to do with specific forms; just as existing east asian architectural traditions made the pagoda, and indeed the Buddhist temple as a whole, almost unrecognisably different from the stupa in China, Korea and Japan, so the colossal formal and patronal influence of ancient Rome – the dome, the arcade, the stone vault, the Constantinian basilica, the domed Greek-cross church – mean that, again, the synagogue DNA in the great churches and mosques of the high medieval era needs a little study before it can be discovered. Still, these pereginations illustrate the extent to which these building types can form landmarks from which wider patterns of religious architecture, or ideas about sacred space, can be analysed. The ‘east’ and ‘west’ division illustrates the extent to which the middle east, with a strong redirection from Greece and Rome, and the Indian subcontinent (very broadly defined), is basically the fons et origo of most of what has comme to matter in the world, both in terms of religious ideas and in terms of religious architecture. The relative continuities of the eastern tradition, in which ideas can be traced about sacred space that are, ultimately undatably ancient, lost in time with the origin of the Vedas; the relative complexities and disruptions of the middle eastern/western one, in which the spread of monotheism and the loss of the Jewish Temple are but two of the more obvious points of increased complexity/trauma, can easily be overstated — but they are still worth pointing out. More to the point, these two building types embody two broad traditions in sacred space, traditions which occur in all cultures, but which they perfectly encapsulate. From this point of view, the stupa, which has its roots in the simple act of raising a heap of earth over a significant burial — that is, in prehistoric Europe, the barrow — embodies the tradition in which sacred buildings do not need to have functional interiors: in which the structure itself is a kind of shrine, and also has qualities analagous to sculpture: that is, it’s very form has meaning and presence and impacts as a three-dimensional object to be aphrended in all kinds of levels. It can thus be compared to the man-made mountains of the ancient world – the Egyptian pyramid, the pyramids of the Americas, the Mesopotamian ziggurat, the great mounds of north-western Europe, and more: these are truly ancient building types, originating in the 3rd millennium BCE, and none are any longer in use. They are also often linked with burial, as well as with attempts by man to imitate mountains. But it can equally fruitfully be compared to more unexpected structures that are external objects of devotion; the giant Buddha-image is perhaps not a shock; more so is the Ka’ba, a cube to be circumambulated in prayer rather than a semidome to be circumambulated in meditation (and still in use, and believed to be ancient when Mohammad cleansed it of its images in the 620sCE), and the saint’s shrine, in form and usage more varied than both but still possessed of comparable ideas: this is something one moves around, an architectonic shape one interacts with. These structures are ultimately reminders of one thing that most religious buildings have in common: the quality of place-making, of marking out or enhancing specific spots in the landscape as sacred, and the idea that a form may itself somehow embody a certain sacredness. The synagogue, on the other hand, embodies a tradition in which religious buildings are venues, houses, palaces even, for the divine: often – as in ancient Mesopotamia, here by the fifth millennium BCE – axial in plan, with the focus of devotion at one end. This can be seen in religious buildings of all traditions, though the axis is turned around in most mosques and many Buddhist prayer halls (not to mention Taoist, Confucian and Shinto temples), it is true of the plaza-pyramid complexes of the Americans, the Hindu temple, the church. The idea that a focus is at one end and some kind of human activity is at the other is the core here: in other words, while they also enclose a spot of the earth, these buildings express the other main way in which religious buildings are defined: by the enhancing and enclosing of a human activity by putting a wall around it and a roof over it, in other words, the architecture to some extent maps patterns of human usage – even when it’s makers consider themselves to be building palatial residences for divine entities, as in Egypt, in Hinduism, and eleswhere. Here again, while the synagogue can stand for this broad and fundamental theme in sacred space just as well as the stupa can stand for the other — and the two themes are by no means at all exclusive of each other — there is a significant disjuncture within this broad tradition, because the synagogue embodies a specific idea about this type of building which is followed by the majority of the world’s population today because it was inherited from Judaism by Christians and Muslims. That idea is that, no matter how much power is accorded any priesthood that may be present at one end of the building, the presence of a congregation at the other end, even if only once or twice a year (but in Islam and most modern versions of Christianity once a week at least), is an essential part of its function; and that ideas about sacrifice and the embodiment of the divine in physical objects are either transmuted (in Christianity) or abandoned (in Islam). This, then, is a very powerful idea and in retrospect the moment of the Temple’s destruction is crucial to its later spread and development, a kind of defining fracture in the ongoing narrative of sacred space in the western/middle eastern tradition. There is another fruitful way in which stupa and synagogue can be compared: as a comparitative study of how religions turn themselves into architecture. If we take the accounts traditional in Buddhism as true, the stupa was to some extent invented within the lifetime of the founder of the faith, and then transformed by a reforming and imperial royal power a couple of centuries later. Let’s have fun comparing and contrasting: the mosque was likewise invented within the lifetime of Mohammad, and then transformed into a work of architectural art rather than a functional and simple space for prayer within living memory of his death, by the Ummayads. The Christian church, by contrast, rather like the synagogue – indeed, in many important respects, to the same timeframe (for we only have synagogues that look like modern ones from the C3-C6ce, precisely when the church appears in a form we would recognise it) – develops its essential requirements away from archaeological or art historical view, in works patronised on a small scale by groups of the faithful, often in houses rather than purpose-built structures, to some extent making it up as they go along. The role of Constantine in transforming this model into a work of architectural art in the C3CE then becomes even more radical than that of Ashoka in the C3BCE vis a vis the stupa or the caliph al-Walid in c.700CE with respect to the mosque, though it is broadly comparable in various ways; and an even greater leap, again comparable in a general way, can be attributed to the pharaoh Djoser in third-millenium BCE Egypt, inventor of the cut stone place of worship. Sadly, no equivalent story can be told for Judaism, the role of which in this grand picture is confused and easily overlooked as a result of the traumatic onward story of Judaism itself; no imperial sponsors, widespread persecution, the synagogue a marginal religious building throughout the millenia when the mosque and the church (and the stupa) came to dominate the sacred spaces of much of the planet. If there is any upside to this, it is the local, the human, the ordinary. Synagogues continued, and continue, to be generally sponsored by small groups of devout human beings: that the transformation from house-church to St Peter’s, Rome; from Sanchi to the Bayon at Angkor; from the Prophet’s House to Cordob,a has never been made arguably brings us closer, in the synagogue, to the more human aspects of the origin and development of religious faith.